I thought I'd better be prompt with this report since I had to let you all down on the mobile blogging front during my trip. This was for number of reasons, the main being mobile signal and the other being the weather. I didn't get chance to sort out a case for my N82 and it gradually got wet/damp and decided to fail on me, losing all of my pooled postings for the blog on day one! I got it working again but mobile blogging was off my agenda by then! We set off at bang on 6AM and hit the M6 - via Maccy D's of course! 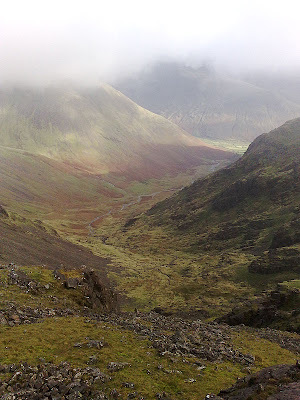 The weather up to Manchester was looking great but soon turned a bit moody and overcast by the time we arrived in Nether Wasdale. We parked at the Church and set off to get some miles under our belts as it was already 10.30 by the time we arrived. My pack felt like the perfect weight and I'd packed carefully this time, using the exped drybags to organise my kit. I'd foolishly packed my waterproof trousers in my clothes sack and so when the first shower of the day arrived just before we hit Greendale, I got a soaking on the legs! 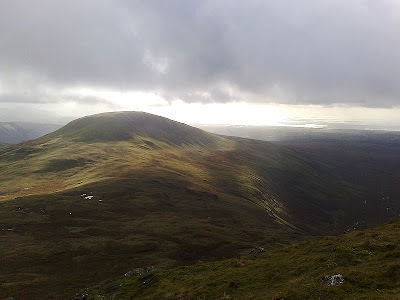 Luckily this cleared at the base of Middle Fell and the patches of sunshine and wind soon dried the tweeds out. 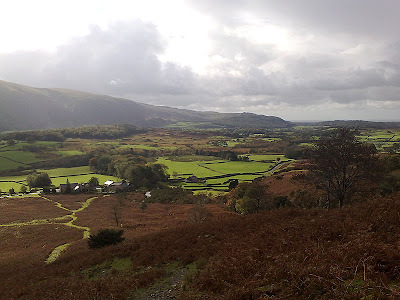 The weather, as forecast, was very unstable but it made for some dramatic landscapes. My SLR didn't make it into my pack as I was expecting bad weather and therefore limited opportunity to make use of it. Instead all of these images are taken with the N82 so apologies for that. 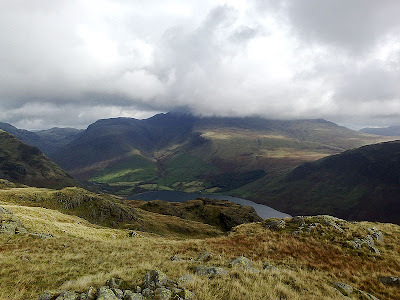 We stopped just short of Middle Fell's true summit at a sheltered spot for some lunch and a brew. 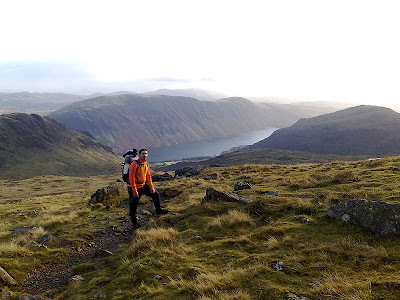 The ocean view from here was stunning but we had to move on as we wanted to have the tent up on Yewbarrow before the sun set. It wasn't as speedy a getaway as I would have liked because Paul's 1-trick Jetboil has a penchant for burning everything he dares drop in it. This time it was noodles and an arduous scraping process ensued whilst I helped out by laughing as much as I could. For reasons I'm no longer sure of, we took the decision not to summit Seatallan and we headed directly off track to Haycock via a very boggy Pots of Ashness. The Merrell Chameleons performed brilliantly and despite the lower height of the ankle it was only a leap of misdirected faith that caused water to breach the top slightly. After a tough ascent we were greeted at Haycock with lashings of rock hard, wind-driven hail - which was nice! On a good day the view from Haycock would be impressive - today it was in the clouds so we noted how windy it was and moved on! We followed the stone wall from the summit of Haycock to Steeple, the whole time being blasted by the side winds ripping across the ridge from the Ennerdale Valley. The visibility was was very poor at this point and missed our track to the left as we hit the top. Steeple has a summit strewn with large slippy rocks and Paul and I had to tread carefully to avoid a fall, especially considering both of our injuries. This was the first time I began to feel the effects of not being able to use my left hand, where I was conscious that extra caution and tentative steps were necessary. We fired up the GPS to locate our path just as the cloud began to clear and our mistake was obvious. 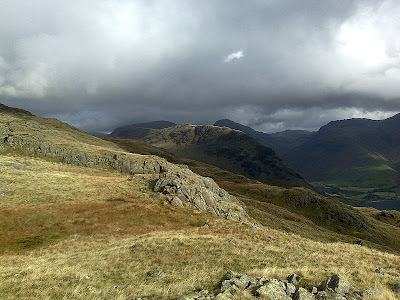 Rejoining the path and heading to Red Pike the sun returned and we packed away our waterproofs for the rest of the day. 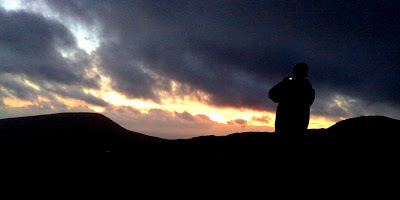 At this stage timing was looking a bit tight as we wanted some time to put the tent up, cook and chill out to a sunset. 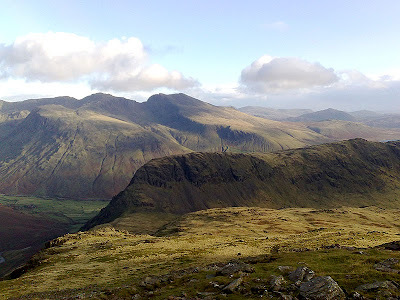 We pressed on down to Dore Head where we filled our Platy's for the night and prepared ourselves for the climb up Stirrup Crag onto Yewbarrow. From Dore Head this looks every bit as exciting as it actually is and was a thrilling end to our days walking - especially with my injury! Looking back down I found it hard to believe I'd done it with one hand but don't tell Charl because I'll be in trouble! 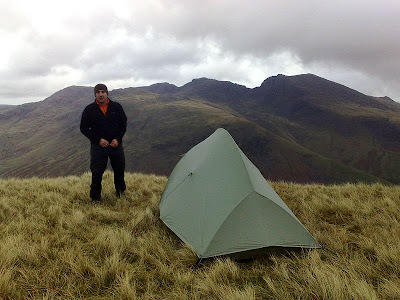 We easily found a pitch on Yewbarrow with an unhindered view of Scafell Pike and set about making camp. We just caught the orange and pinks of the setting sun and at the time were happy with our choice of pitch. Burnmoor tarn was visible to the south as was the Wasdale Inn down in the valley. The wind picked up again and was bitingly cold for October. MWIS had quoted -5 in the wind which prob wasn't too much of an exaggeration at that point. Paul and I had arranged to share the cooking of a curry and rice for tea so we both got layered up on the clothing and set about cooking. My F1 lite stove struggled with the strong wind until I managed to find a spot behind a rock. My homemade windbreak just kept flapping around and once the water was boiled it was into the pot cosy to finish cooking the rice. Once again, I thoroughly endorse cookiing i this way as it just so much more efficient and convenient. The MytiMug worked fine and the handles never did get as hot as I had predicted. We cracked open the ciders and sat with head torches enjoying the curry which I wolfed down as fast as I could just to get out of the wind. It was an amazing night with a full moon and partially clear sky. We just sat talking and watching the stars with the tent door open until I got tired and moody and went to bed at about 11pm. No quibble with the photies mate. The photos are ok but only with a lot of touching up to get the sharpness right. Exposure is generally very good for a camera phone though. Cracking that. The photos are very good with a phone!. What can you do better with a DSLR? All in all a good walk indeed.